On Thursday, August 18, NEOSTEK’s Kevin Parker presented at a quarterly virtual Information Symposium that was put on by Information Coalition. Kevin’s topic during this presentation was “The Business Case for Information Strategy and Architecture”. Information is one of the most important business assets, yet most organizations deal with growing information chaos. Buying more technology is not solving the problem. Developing a unified enterprise information strategy and architecture is now a business imperative. 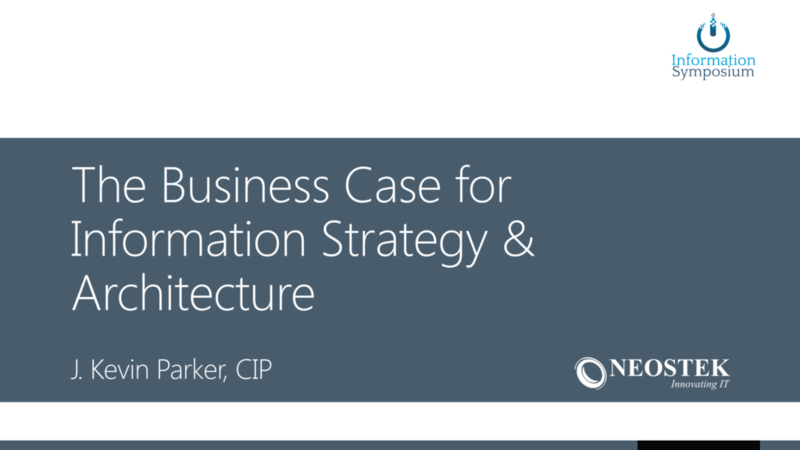 This presentation focused on why Information Strategy and Architecture are so important and how to include them in a strong business case.